In an interview to Allure, Aerin Lauder said: “Everyone who smells the new scent really loves it, because it is very floral, and it’s very easy to wear. It’s not polarizing; there is nothing unusual about it. It’s not spicy and scary, it’s just like a beautiful bouquet of flowers.” (Allure, August 2007, page 245) Before I smelled Private Collection Tuberose Gardenia, I found this quote puzzling, doing a disservice to the scent. Easy to wear, nothing unusual about it? After sampling Tuberose Gardenia, I understood that Lauder was talking about the classicism and elegant simplicity of the composition. There is nothing unusual about a white sundress, that eternal summery classic, and yet it is endlessly attractive. The same would be true to say regarding the new Lauder perfume; there is nothing particularly unique about this harmonious union of two white florals, nothing except its lusciousness and its extraordinarily silky feel. Tuberose and gardenia are fierce notes and, when put together, might result in a blend of formidable headiness. In Private Collection, however, the star notes, although not understated, smell soft, non-aggressive. The long-lasting scent certainly has presence, but it is not a forceful presence, the sillage envelopes one gently, like an organza shawl, and does not loudly herald one’s arrival or impolitely linger in the room after one’s departure. It is a simple scent, in a sense that nothing distracts the nose from the natural beauty of the title notes. Tuberose and gardenia appear simultaneously the moment the fragrance is applied, and go hand in hand till the scent wears off, many hours later. The two main notes are apparent from start to finish; in the very beginning, a cold, almost green floral accord, which I take to be lilac and lily, freshens the composition slightly, only to disappear very fast; at some point towards the end, a scent acquires a certain dry piquancy, which might be carnation…but really, if one is not tracking the development at regular intervals in order to prepare a review, one might not register the notes that appear in supporting roles and would probably just enjoy the unadulterated beauty of tuberose and gardenia. When I wear Private Collection Tuberose Gardenia, I feel as if I am one of the “attractive people doing attractive things in attractive places” that inhabit the world of Slim Aarons’s photographs (see his books, Once Upon a Time , A Place in the Sun or A Wonderful Time. An Intimate Portrait Of The Good Life ). It is the beau monde of pool parties, croquet and white villas overlooking always-blue seas. The world where women wear white sundresses with simple lines, made of luxurious fabrics, and exude the air of thoroughbred elegance. Coming back to Daniel Annese’s idea of “retro” scents, I would not go so far as to say that Private Collection Tuberose Gardenia smells in any way old-fashioned. It has the patrician elegance, the approachability and the versatility of a classic. Sometimes, when I am in the presence of a scent which, I feel, possesses that indescribably timeless quality that will make it smell as interesting and appealing to my grandkids, years after I am gone, as it is to me now, I get a sort of a pleasant butterflies- in- the-stomach sensation. I have that fluttery feeling every time I smell Private Collection Tuberose Gardenia. 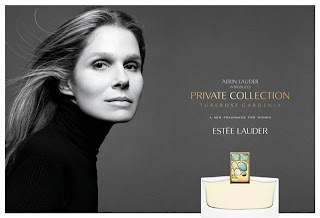 Image sources, Estee Lauder, Stanleywise.com. 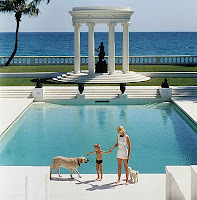 More of my favorite Slim Aarons images here. Please visit Aromascope to read Ina's review of the scent. Wonderful review! I can still clearly remember our initial impressions when we sprayed it on at Bergdorf's. I mean, your instant approval was pretty self-explanatory but me liking a white floral? Unheard of. ;) At least, not instantly. But we both did! And still do. :) It is indeed like silk. Beautifully written, Marina. I will try this one with confidence. I like gardenia, but have mixed results with tuberose. This combination sounds promising. Your reviews could be classified as "essays" or even poetry. I confess I haven't tried it yet, but, as I'm all over tuberose, I will probably end up buying unsniffed. I know I shouldn't, but come on, Tuberose AND this review...what's a guy to do? Well, I clearly need to try this again. I sprayed it at the end of a long day, and while I liked it fine, I didn't think more of it than that. . . And then you burst forth with this poetry! It was the best thing I smelled on the first day of that weekend. Maybe even on both days. I think there is no way you won't love this one. or at least like it a lot. What a perfect illustration for your great review! I believe that's WASP icon CZ Guest standing there by her pool in Palm Beach. Those were the days... okay, I need to get busy and smell this, the raves are unanimous. Can't believe Ina likes it! That is Guest and her son (and the dog). Angela said that the original Private Collection should be worn by CZ, and Tuberose Gardenia would be just as fitting for her or for anyone in that set/time. I am captivated by the blue and the white on that picture, incredible. well no need for white sundresses over here this year but I'm still looking forward to trying this especially after your lovely review, Marina. I suspect it might be one of those scents I can only aspire to though. I do not remember that you owe me a package--but, um, sure, whatever you say. And thanks! I find it very "accessible". Not la-di-da like some classics and not too heady like some white florals. I do, Oeillet by Scent Systems, remember? And I have a couple of other new thingies too. BTW, I love your nickname! I love this fragrance.....Right after you got back from NYC and mentioned it I became obsessed with finding it. Because I live right across the street from SAKS 5th (both a blessing and a sin! )I was able to get my hands on it pretty easily. They had a release party and gave away lots of things including sample bottles like you used to get! The body cream is very silky and although I usually don't like them it will be my next purchase. I have to admit that I have not fallen this hard for a perfume since I discovered Diorissimo, I think that it's the trueness of the scent. I just can't seem to get enough of it, and fortunately my husband LOVES it. It's warm and captivating, quite frankly the first fragrance that I've tried in a while that is absolutely better when worn sans clothes! They are really generous with the samples , but if you are anything like me, you will use them up in no time and have to buy a bottle of your own! M, Another one we both love! This & the new Prada iris are easily my favorites so far this year. Estee Lauder really did a great job with PCTG, and wholeheartedly agree with "there is nothing particularly unique about this harmonious union of two white florals, nothing except its lusciousness and its extraordinarily silky feel". Great review! I can't believe we agree on two scents :-) No wonder there are weird things happening, like tornadoes in Brooklyn, etc. Seriously though, I am very impressed both by this and Infusion d'Iris. Such a proper review has no place to mention - so I will - that Mr. Colombina (me) LOVED this fragrance on YOU. Rarely as you know, do I VOLUNTEER an opinion on any of your gazillion scents. This is because I know that even if I HAD an opinion - which I suspect I am genetically engineered not to - I could not comment intelligently in your world amongst the 'scentsational' people. But I will take the "ART" approach in saying I don't know what I like or why I like what I like ... just that when I like something, I will know it. And I LOVE THIS! Wear it all the time! Do not be afraid its appeal will diminish with repeated wearings... and you'll get more attention (from me) than than the ribs booth at a Baptist picnic! All my love - and Happy [ '29th' ]Birthday in advance! As they say, beware, your wishes might come true. I wished for years I'd find a scent you wouldn't just consider "nice" or "smells like perfume", but would love...but now that I found it, I feel like I should wear it all the time, and I can't wear any one scent all the time. I am not monogamous where scents are concerned :-D But I will wear it very often! Did someone say.....Happy 29th Birthday? I love Leos...am surrounded by them actually and am right on the cusp myself. Let me be the second to wish you a wonderful birthday in advance...When would it be? Thank you so much! Yes, *cough*29th*cough*. Ahem. I am on the Leo /Virgo cusp! I am 47 and I alive to tell you that all things get better past 40! So good in fact that I am truly looking forward to 50! Thirty was wonderful...so please enjoy! Life's just really starting for you darling! (and it's a damned good ride!) All of the silly emotional stuff begins to ease up past 30, and by the time 40 hits , you've got so much confidence that people are just drawn to you like bees to flowers! By the way, I really like your new blog..I'm absolutely passionate about culture and fashion, and those photographs are just wonderful! I'll look forward to reading it daily! Oh Beth! I love that -- "a scent better worn with clothes off"! Marina, dear, won't you consider a post on this subject? Maybe a doubleheader with Ina? :-DDD I imagined the pictures, wish much relish, but this is sort of a family blog, more or less :-))) But that is a very, very interesting topic, for sure, scents like that. b) I'm newly 48. not exactly looking fwd to 50 but gotta say, 40s have been damn great. Great review as usual - this one is a hit! Oh, but I do wonder why this one does not work for me after reading all the comments from people who love it - but my skin devoured it and it was gone, and I don't know why! I had it on in several places, in order to properly test it (translation: the sales lady at Saks was quite concerned that I would empty the bottle the way I went at it) but it just started to GO after 5 minutes. I was actually wishing it was headier so it would stay around, as it was wonderful at first. But that darn "Lauder accord" showed up and it was toast. I know it's not me, because I am the White Flower Queen, they just love me. (I even changed my mind about Songes recently after trying it again - it is fabulous on me. Go figure.) I wish this worked for me - for 5 minutes it was magic. Oh how sad! It lasts all day on me.